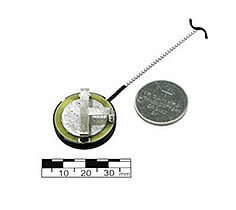 The transmitter is on a printed circuit board, protected with a plastic cover. The power supply connector is located on the back of the circuit board. The product is also equipped with built-in microphone and external antenna. The transmitted signal can be received by special receivers or by any regular scanning receiver with WFM mode. As soon as the battery is installed into its case, the product will be immediately active.